Fact: It’s an often repeated myth that if you use lecture capture then students will simply watch that and won’t actually bother to turn up to class. However this is at odds with the research1 which suggests that it has little to no effect on student attendance. Myth: Younger generations of students are Digital Natives. A lot of young students, even those born in the 2000’s, often cannot use technology adeptly and often struggle. Technology has in many ways become less active and more passive and while many younger students will be competent using technology to passively consume through social media, streaming services or Amazon, they may not be able to copy and paste or actively use technology for learning purposes. This means these students can often be excluded from contributing to class. Choosing to assume that using technology will automatically make things easier and more intuitive to students is clearly wrong. An approach that does not exclude anybody and makes learning an exclusive experience is the right way. Fact: Multiple choice questions are often only utilised as a method to test rote memorisation of facts and while that is one approach that can be used with them, they can also be very useful as a method to examine student opinion. Using a tool like PollEverywhere, for example, you can gauge a class’s opinion on a certain topic to ascertain their interest or to identify weaknesses in student comprehension and where the learning should go next. Multiple choice questions can also be used in confidence-based testing which is a method of testing which measures not just what a learner knows, but also their confidence in that answer. This prevents multiple choice questions from just being about memorisation and random chance in a student’s answer. Myth: Everyone has an individual learning style that works best for them. Fact: This is the idea that everyone has their own individual learning style such as visual, auditory or kinesthetic with which they learn best. This myth is widely believed both by the general public and those within teaching, but it’s never actually been proven to be real with current research suggesting it was never anything but a neurobiological fiction.1 It’s a myth that is not only wrong but that can harm future learning as it may lead to a fixed approach in the student mindset which could serve to impair their future learning by making them less likely to try new approaches to learning. The truth is that most students benefit from a mix of tasks that force them to actively engage with the material. Focusing on one single approach can be harmful and restrict students’ learning potential. It’s also important to get students to think about how they are learning and taking in information but not to fix them to only using one particular style. ” Videos are often no more engaging than a lecture, unless you regularly pause and actively think about what your learning, but with a book you have the opportunity to do this and then bring your thoughts to the class. This means less class time thinking about content individually and more time discussing and engaging with it as a group. For more information about flipped learning, please visit the Active Learning Network website, created by University of Sussex colleagues Wendy Garnham and Tab Betts. So what can we learn from this? That it’s worth investigating any theories we hear and that we shouldn’t accept ideas as true just because a large amount of people believe in them. In this era of fake news it’s always worth looking into things yourself. 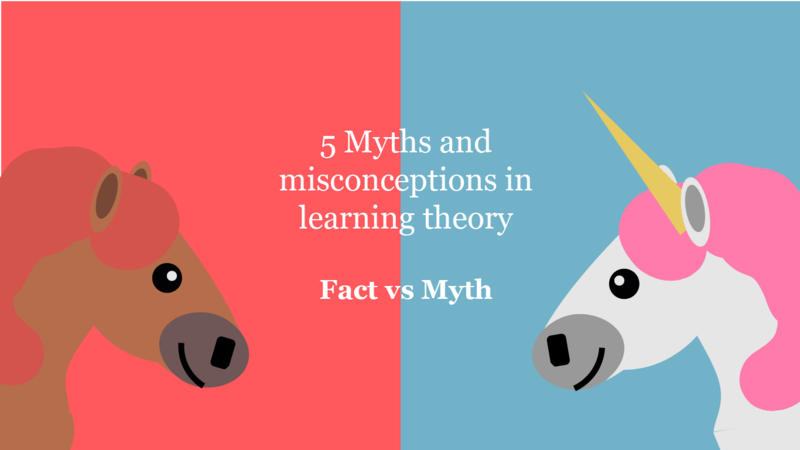 1 Pings/Trackbacks for "5 Myths and misconceptions in learning theory"